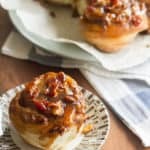 Everything is better with bacon… and that goes double for these super-fluffy sticky buns topped with a gooey bourbon-maple caramel, chopped pecans and lots of crisp-fried bacon. In a small saucepan set over medium heat, warm up the milk and butter until the butter is melted and small wisps of steam are just starting to come off the surface of the milk. Pour into bowl of stand mixer fitted with a dough hook. Add yeast and let stand until frothy, about 4-5 minutes. Add sugar, eggs, salt and nutmeg, and beat until well combined. Working on low speed, add 4 cups of flour, and continue mixing the mixture forms into soft and elastic dough that pulls away from the sides of the bowl, adding the remaining half-cup flour a tablespoon at a time if the dough feels too sticky or isn’t coming together. Shape the dough into a ball and transfer to a lightly oiled large mixing bowl, turning to coat the top with oil. Cover with a clean dishtowel, and let rise in a warm, draft-free spot until doubled in size, about 1 1/2 hours. While the dough is rising, prepare the caramel. Lightly butter two 8-inch round cake pans. Stir in the maple syrup and brown sugar. Cook, stirring frequently, until the brown sugar is dissolved and the mixture starts to bubble. Cook for 2 minutes longer, then remove from heat and stir in the bourbon (if using). Pour the hot caramel into the prepared pans, dividing evenly. Roughly chop 4 bacon slices. Scatter the bacon pieces and the chopped pecans over the caramel in the pans. Punch down dough. Transfer to clean, lightly floured work surface, and roll out to 15×11-inch rectangle. In a small bowl, mix together the melted butter and brown sugar. Spread this mixture onto the dough, leaving a small border around the edges. Finely chop the remaining 4 strips of bacon, and sprinkle over the filling. Starting with one of the long sides, roll the dough into log, then pinch the seam closed to keep it rolled up. Using a length of dental floss or a sharp knife, cut the dough crosswise into 16 equal slices (each about ¾-inch wide). Arrange the rolls cut-side-down in the prepared pans, spacing them as evenly as possible (don’t worry if the rolls look too far apart right now – they’ll expand to fill the pan during the next rise). Cover the baking dishes with plastic wrap. Let dough rise in warm draft-free area until the buns are doubled in size and have almost filled the pan, about 40 to 45 minutes. While the buns are rising, preheat oven to 375°F. Bake the rolls in preheated oven for 20-25 minutes, or until tops are golden brown. Let cool in the pan for 5 minutes, then carefully flip over onto a serving plate. Make sure to unmold the buns just after they come out of the oven, while the caramel is still hot and liquid. If you wait too long to do the flip, the caramel will firm up and the buns will stay stuck in the pan – if that’s the case, just pop the pan back into a hot oven for 5 minutes to warm the caramel back up, then try again.